My mother told me that it was very important to have a Sweet Sixteen Birthday Party, actually, a “Sweet Sixteen and Never Been Kissed Party.” I was probably about six at the time, and this thought captivated me. I pictured myself at that Exciting Party, turning sixteen. I would be tall and thin, like Barbie. My hair would be in a long flip. I would be allowed to wear makeup! I imagined myself in a dress with a beautifully cinched waist and flowing skirt, cute high heels and happy friends all around me. I pictured a boy, he would be handsome like the new Allan doll, not like Ken. I thought Ken was kind of dull. So, Allan would be my date for my Coming Out Party (back then, Coming Out meant being allowed to date!). He would be dressed in a white suit with a black tie, bringing me a corsage of beautiful red roses, or maybe pink. Or even yellow. Anyway, they would be perfect no matter what color they were, and I would be so excited to have boys at my party. There would be plates stacked high with cool little sandwiches, sodas to drink, and a huge cake. There would be music and dancing, and maybe even a surprise pink convertible as my birthday present. I thought maybe I would have a luau theme, with flowers everywhere and a pool. Yes, definitely a pool. The thought of that huge party inspired me to vow there would be no way a boy would kiss me before I turned sixteen. It’s my party, I can cry if I want to! That’s Allan on the left, in blue and pink. 😉 Hey, cutie. 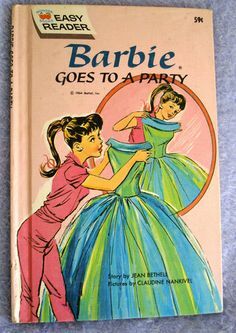 By the time I turned sixteen, those Barbie doll dreams had gone up in smoke. There were no dresses, no flipped hairstyles, no happy friends, no Allan, no party, no cute little sandwiches, flowers or cake. There was no car, and definitely no pool. I had been kissed–not only kissed, but I was a single mother to a one-year old. Life was about dragging myself out of bed, when most teens were sleeping twelve to fifteen hours a night, to get my beautiful, bright-eyed little Baby Girl’s diaper changed, get her bottles ready, get her dressed, keep her happy while I showered and got dressed, get us fed, and out the door. We walked two miles (sometimes I carried her if my mother was punishing me by not letting me use her stroller), to the sitter’s house, who was paid by government funding, so I could finish high school. I would kiss Baby Girl and be sad to leave her as I rushed to get to class on time. I was always late. After school I’d pick her up and we’d walk back home, another two miles. That’s us, I kept thin by not having a car! Sleeping baby, the most beautiful thing! I was determined to finish school and make things better for Baby Girl than they were, and better than they’d been for me. Baby Girl, about that time. Love her! Flash forward, now Baby Girl is sixteen, going on seventeen. As it turned out, she had to put up with quite a strict mama. I didn’t want her to have to go through what I did. Things are better now, though. She has a step-father who adopted her. He does his best to be a good father. She is a cheerleader and ballerina. She is beautiful, compassionate, smart, and even relatively tidy. She has a few good friends and a lot of people who admire her, but inside, she is a little shy and not sure if she fits in. She drives a clunker, but it has wheels and gets her around. Her biggest problems are that her parents have some ridiculously strict rules and she is not yet fully aware of how wonderful she is, so she throws her emotions into boys who are not worth it. Oh, and she doesn’t have enough money to buy more than one pair of Giorgio Armanis. That’s not her, she never would have worn those shoes! But the slacks, to die for! Okay, so truth be told, there were a few more significant problems than these, but that’s for her to tell. Once again, no big Sweet Sixteen party. She’d been kissed, but she didn’t get pregnant. We had dinner out with her boyfriend. He wasn’t exactly Allan, but he wore a suit and brought her a corsage on junior prom night, and he drove a sweet car. Sixteen for Baby Girl was not the best year for her, but it was a pretty normal teen life overall: Teen angst, friend and boyfriend issues, parents with rules issues, riding horses, beach days, homework, weekend chores, the mall. Jump again, and Baby Girl’s Baby Girl approaches her last days at sixteen. Things are even better as our family develops, but still, far from Barbie’s world. This year I’ve seen this precious child grow from a troubled fifteen-year-old who was pulling away from all that was good in her life, to a self-aware, deep, funny and dedicated young lady. Baby Girl’s Baby Girl leaps into a brighter future! She rather reluctantly left behind a crowd who were too troubled for her to emulate, and returned to her first love, gymnastics, accepting that even if she was “too old” to make it to the Olympics (of which she dreamed and worked toward for years), she had to admit that she just loves the sport. I respect her for caring about troubled kids, but grieved over her exposure to some seriously dangerous and damaging mindsets. I am thrilled she has returned to her sport, and proud that she enjoys helping kids with disabilities participate in sports, too. She has a steady “Allan” who is more of a “G. I. Joe,” for over a year now. Her school life this year has been different than the typical teen’s; instead of school dances and weekends at the mall, she’s been on the phone talking with her long-distance sweetheart, and probably laid in bed worrying (with us) for G. I. Joe’s life on the front lines in Afghanistan. He’s home now, for convalescence after a fractured leg, so my hope today is that my Baby Girl’s Baby Girl thoroughly enjoys these last days of being, simply, sixteen. Take lots of pictures and videos. Be as silly as you like. Write your heart out (Girl, you can write!). Draw (you’re so good at that, too!). Ride a merry-go-round and don’t worry if anyone thinks you’re acting like a kid. Hang out with friends. Jump in the pool with your clothes on. Do cartwheels and handstands even if I worry that you’ll break something. Sleep late and stay up late. Enjoy the people who love you. Enjoy being you! How about you? Do you remember the last days of sixteen? What changed that year, for you? Current Selfie. Oh, no! That’s Barbie at 50. Hey, I look better than that now! How about them apples, Barb? Oh the memories! You were such a big dreamer as a little kid! A barbie life? I had hopes of climbing mountains. Boyfriends? Ppshhh! Didn’t even cross my mind until I was at least 12! My Sweet 16 was crazy. I was living on the farm and in typical farm life, I lost track of what day it was. Mom and big sister called to sing happy birthday to me. I had no idea it was my birthday! It was not a happy day. Loads of drama, but it ended well. Geoff Wolfe took me out to the Meadowlark Inn for dinner and I wore some awesome borrowed clothes from Marian Tiemann and Sharron Kessler. My little girl did get the sweet 16 and never been kissed blow out party. 🙂 That made me very happy to be able to do. She is everything that I was not. ~A straight A student, a huge lover of books, actress, confident, and never had a brush with the law! Me, a dreamer as a kid? Ha! When did it stop? You’ve obviously done a great job in raising a well adjusted young woman. I can certainly relate to the challenges you allude to with respect to raising a child in their teen years. I am going through that right now with my 14 year old. The joys of parenting! I say that sarcastically but really wouldn’t have it any other way. Thanks for sharing your story! Joan, this was amazing. I loved how you took multigenerational snapshots of your family. This couldn’t have come at a better time for me, too. Lately I’ve been getting frustrated feeling like there is no life beyond the doldrums of babyhood. As you know, these days can seem so long and tedious. It’s a great reminder that life does go on. Thank you so much for joining RTT this week. It was a joy to see you on the grid. Emily, thank YOU! You are such a good writer, and have so much life, love and laughter in your posts, you inspire us! You are wise beyond your years, so I forget that you are still in the early stages of parenting. To me, those years flew by, but only now, because so many years are behind me. In the midst, they went by slowly. By the time Baby Girl was 13, my family started teasing me for worshipping at the shrine on top of the tv set, where all her baby and school pictures were. I would just sit and look at them, missing that little girl who would curl up in my arms. I loved her teen, and now her adult years, too, but there is just something extra special about those little ones in our arms, isn’t there? Wear yourself out enjoying them, you won’t regret that. You’re welcome. I bet there are a lot more good stories of young single mothers. I think reality tv shows on teen moms tend to bring the most entertaining (i.e., dysfunctional) ones to our attention, and we had plenty of drama and dysfunction, but, thank God, plenty of improvements, break-throughs and great endings, too! What a powerful story, Joan! How strong of you to go from that Barbie world we all hoped for back then, and raise a child as a teen mother. It takes a strength of character that I’m sure you didn’t really appreciate until later! I love that there are three generations of “sweet 16” here… my mother too, taught me to wait for the Sweet 16, Never Been Kissed. I had my first kiss just a week before my 17th birthday, and fell in love shortly after. The times… they are a changin’! Wonderful addition to the blog hop; thanks so much for joining in! Your kindness! I don’t know about character back then; I just had a heart for my child that drove me. The character developed along the way. I’ve often credited my daughter for saving my life, as my heart for her compelled me into the life that ended up being good for me, too. I later found that this angel/savior role, which I never meant to cast on her, was actually a burden for her, as if she had to keep it up! It is always good to talk about these things, for in sharing our hearts we’ve found a way to be mutually supportive as adults. Good for you, sweet sixteener, for holding out until almost seventeen! Some of those kisses really send us for a ride, don’t they????!!! Ha! 😉 You made me smile this morning, thank you!